I chose these toddler tees from Fig Leaf Baby to feature as a "TWINtuitive Product", because a large percentage of twins are born prematurely and this baby clothing boutique specializes in clothing for preemies. Our own twins were born 9-1/2 weeks early. They spent two weeks in the NICU and then another three weeks in the Special Care Nursery. If you are looking for gifts for preemies, whether for singletons, twins, triplets, or more, Fig Leaf Baby is a good place to start. 1) First I want to point out that these "N.I.C.U. 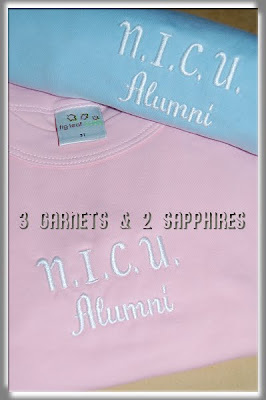 Alumni" t-shirts are currently only available in long and short sleeve preemie-size bodysuits. Fig Leaf Baby was nice enough to have these toddler tees made especially for my twins so I could experience their products first hand. I do think they should offer this shirt in larger sizes because being a NICU graduate is something to celebrate for a long time. 2) I honestly was bowled over by the quality of these t-shirts. It is apparent that every detail about the clothing is first class. 3) What impressed me the most about these shirts was that they are soft as a cloud. 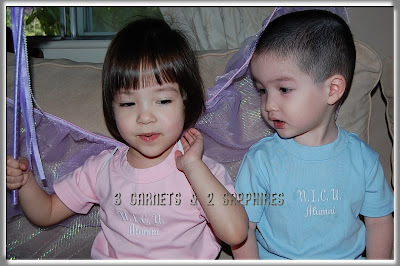 They are made of 100% Peruvian Pima cotton. I would love to see Fig Leaf Baby add sleepwear to their line in this fabric. 4) I like the fact that this clothing is dyed with organic vegetable dyes. This is so important for preemies and newborns who have such delicate skin. 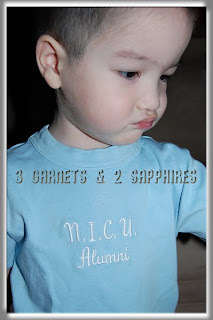 5) That these shirts are embroidered with text rather than screen printed, makes them an even more impressive gift. 6) These shirts are labeled inside and out. On the inside, there is a satiny fabric Fig Leaf Baby label, which is soft and did not irritate either twins' necks. 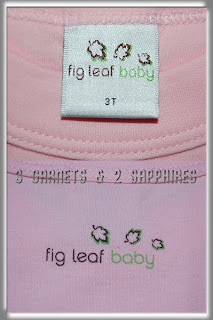 On the outside, the Fig Leaf Baby logo is discreetly printed on the upper back of the shirt. 7) One thing that usually concerns me about embroidery is the possibility of the underside irritating the skin. Fig Leaf Baby uses a backing that dissolves in the wash, which it did completely disappear in the first washing. 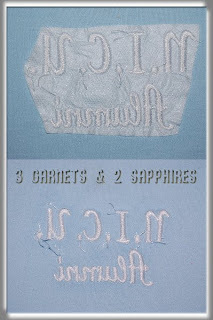 Still, I was worried that the embroidery itself would cause some itching because sometimes the lettering can get stiff. I was relieved to find that I was able to soften the embroidery with just flexing it here and there a few times. Both twins wore these shirts right against their skin with no signs of irritation at all. 8) These shirts washed very well. There were no signs of shrinking, pilling, or misshaping. The embroidery also stayed completely intact. Fig Leaf Baby's selection is not limited to tees and bodysuits for preemies, newborns, and toddlers. Their line also includes preemie and newborn tops, pants, jackets, dresses, and hats. 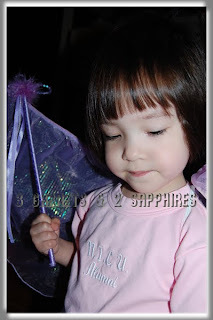 To view their full line of clothing and accessories, visit FigLeafBaby.com . A portion of Fig Leaf Baby's proceeds go to the K.I.D.S. (Kids in Distressed Situations) children's charity. Through September 30th, 2009, my readers have been invited to shop Fig Leaf Baby and to save 15% on every order placed using the Promo Code: 3G2S15. 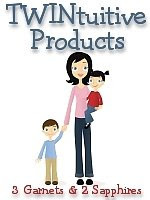 Thank you to Fig Leaf Baby for providing us with a review product free of charge.